Since Blackberry Oaks Golf Course opened in 1993, our No. 1 priority has always been the customer experience. We want every golfer to arrive with high expectations for a memorable day of golf. Home to an 18-hole championship golf course, the area’s finest practice facility and the Chad Johansen Golf Academy, Blackberry Oaks Golf Course attracts players from across the region who desire a day of golf that exceeds their expectations. We are proud to have partnered with the USGA, IJGA, CJGA and other organizations to host qualifiers, tournaments and outings that set the standard for future events. Golfers plan their events with Blackberry Oaks Golf Course because they know our staff will see to every detail. Even our own events – like the annual Blackberry Amateur – are favorites among players who return to compete year after year. From superior customer service and top-notch amenities, to pristine playing conditions – Blackberry Oaks Golf Course lives up to its reputation as “The Best Value in Chicagoland” round after round. Golfers come to Blackberry Oaks Golf Course for a great golf experience, but they come back because we treat every guest like family. 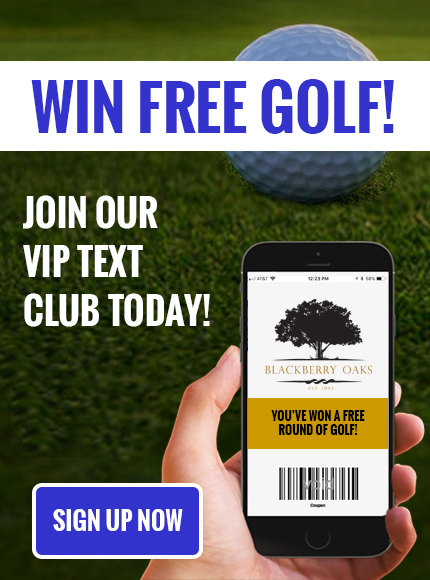 "Blackberry Oaks is truly one of the best courses in the Western Suburbs in my opinion. The course is not long but can be challenging for all including low handicaps. Well protected greens, lots of hazards including ponds, creeks and tall fescue. Great course layout and the greens are amazing!" "You can't get much better than playing the Oaks. The layout is fun and challenging at the same time. Course is always in great shape and amenities are getting better by the day. The restaurant is the perfect ending to a great day of golf. Definitely take the time to play this course." "Blackberry Oaks is one of the best golf courses in Illinois. If you haven’t played there you are definitely missing out!" "Hard to find a better value in all of Chicagoland. Pricing is always competitive and the pace of play is above average every time we play it." "This course has several risk-reward holes and a great challenge for the beginner, intermediate, and advanced golfers. Put this on the list of courses to play in the western suburbs." If you are willing to take a ride out from Chicago, highly recommend this links style course. The yardage makes you seem like it’s an easy course but it’s a challenge and well worth the drive." "Course was in great shape and the staff treats you right." "There are several courses to choose from in the area, Blackberry Oaks in my opinion is the very best option. The layout of the course is great. I highly recommend playing this golf course." "Blackberry Oaks is a challenging and fun course to play. the course is in very good condition consistently and the staff is super friendly and accommodating."